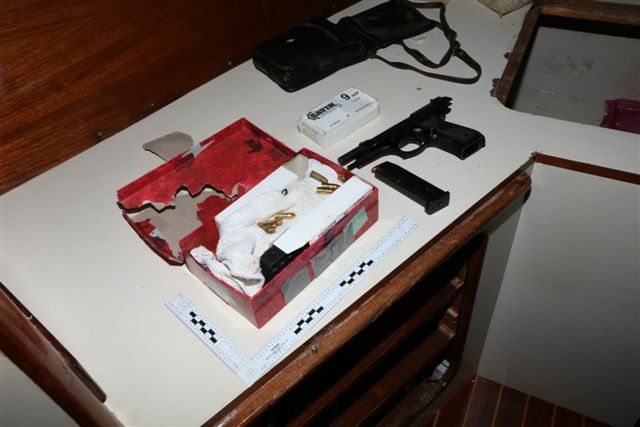 Officials have released photos of the seized items after a Latvian sailor charged with being in possession of $48 million worth of cocaine, a gun and ammunition was found guilty yesterday [June 7]. 29-year-old Janis Zegelis sailed to Bermuda from Trinidad arriving in July 2011, and was arrested on August 1, after Customs officials searched his boat while it was docked in the St George’s area. During the trial, Mr Zegelis said he was paid to sail the boat from Trinidad to Latvia by a Russian man, and had not intended to come to Bermuda, however diverted to the island after experiencing problems with his sailboat saying he discovered the cocaine in a compartment on the boat after a few days at sea. 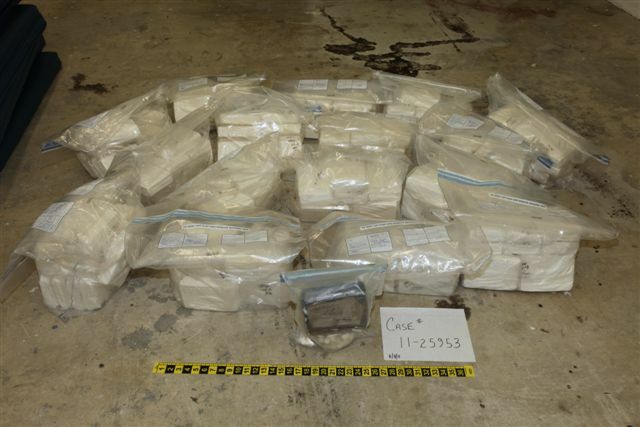 He was in possession of 165kg [363lbs] of cocaine valued at $48 million, a 9mm Beretta, 192 rounds of ammunition and two extended magazines. Mr Zegelis faces a lengthy prison sentence, which will be handed down at a later date. So where does all this blow go? All im saying is if this was going to Russia, you better believe someone in the mafia there was getting it. It would be in our best interest to send it to Russia, get it out of this island, off our hands, because there is a reason the US do not mess with Russia …..or Korea for the matter. Mate that was the exact thing I was thinking. Send him and his cargo crackin! i’m with u there mate. the last thing we want is some russians coming this way lookin for their blow. I agree! Doesn’t make sense keeping him here so we have to pay for him. Let him go about his business! There is a responsibility to the world for all judicial systems to operate lawfully to the full extent of the law as on the books of that country. With that said, if his home country is willing to allow him to serve whatever punishment he receives there; than all the better for Bermuda. However punishment must be delivered. Because Bermuda is in debt, and it will cost us to house him we should sent him on his merry way? 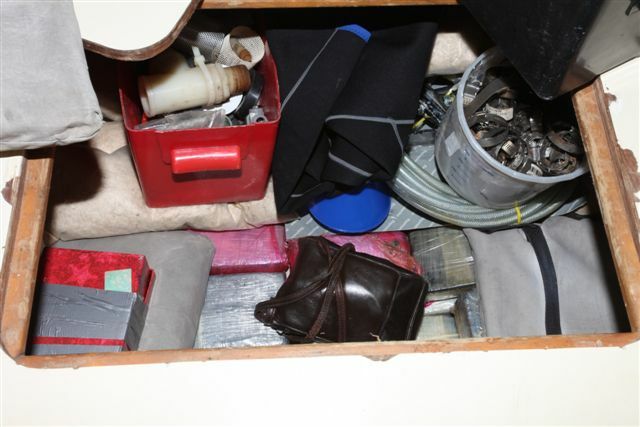 This guy was smuggling drugs that could kill and F@ck people’s lives up! End of story. Because he was not coming here things should change. He wants a break; he should have dump the sh!t before he got within our water. Does the U.S. not have the responsibility to deal with the Bermudians who said their drugs were not for sale in the U.S. and they were coming here? I’m guessing future drug smugglers would see Bermuda as a stopover if we head down that Path. When do you think they would not than try to test Bermudas market? We have a responsibility to perform our duty as a law-abiding nation regardless of the cost. Hopefully the deal comes off and he serves time in his home country. CHINGAS DUN, thats a lot of cocaine! My Auntie couldn’t even snort that much and shuss been doing it for years! Okay. So worst case scenario. His Russian “contacts” come here to recover their “package” and to kill this Zegelis fella. How in the world would that be dealt with? What’s to stop them from breaching WestGates walls to get to him? Hey, it could happen. I say, send him back to Latvia, along with the cocaine. Get him and the drugs out of here. Kind of scary..
Are the Bermuda Police Force equipped to deal with that? Are the officers up at the WestGate prepared? Just saying; it could happen. Is anyone thinking like I am? 2 ensure knobody profits off of it I’d like to see a video of them destroying it!!!! Because you know one day it’s here then hocus pocus it’s gone then were left wondering how did that magic trick occur!!!! Scardy cats, who is scared of the Russians tell them to come and join their Latvian mate up west doing at least 30 years. I’m all for deportation as well but they have no intentions of shipping the drugs off maybe him but far as their concerned those drugs belong to Bermuda since they were salvaged in our waterz so burn them!!! And what you haven’t factored into the equasion is that Bermuda amplifies the value of everything grossly beyond what it’s worth and the value is the chopped down value @ 48 million they said 17 million if sold wholesale so you take that into account and it’s probably not even 10 million worth. @Too Bad: You never know. Maybe some of us are over-reacting,being melodramatic, etc., but hey, you never know. It has been known to happen in other countries…just because it has yet to happen here, maybe its our turn. Given the amount of drugs, money, lost by parties unknown, who’s to say that they won’t come to get their stuff back, or at least attempt it? Don’t dismiss it, is all I am trying to say..
Any one that dismisses that possibility is jus plain simple and dumb. The Owners probably have already struck a deal to get it back…Here Take $5,000,000…NOW GIMME WHAT’S MINES!!….hahahaah!! Ok, I assume the $48m figure is the street value in Bermuda. So how much did it cost to purchase, and what is the street value in Russia?! I’d imagine Bermuda hasn’t seen 81% purity for quite some time now. Does that $48m figure assume it was sold as is, or was cut with something to increase the quantity available for sale? As for destroying it or sending it to Russia or Latvia, perhaps its a little too late. Realistically it could have been on the streets for some time now already. How long was this guy chillin on the boat before he had unexpected guests? Can we have some video proof that this will be destroyed, I very much dought it considering the amount of locals snorting the stuff. Better he forget about Latvia in this life ; as for the coke , well it could be had diet or regular , it’s your choice . Could differ from the present accounts of what the media are relaying from the courts of 166kgs of drugs at a cost of 48million compare to the police report of 167.3kg of drugs at a cost of 39.3 million. I wonder where the extra 1.3kg has disappeared? I would hope that the governor or the military are present when they burn the drugs because as it has been sitting for nearly a year waiting for this trail which is a long time for a simple close case “the guy had the drugs and he was found with it on him” If some one is found with drugs coming through the airport they are in court that week. Took nearly a year to bring the man to court. Lets all gather around and see the drugs burn so we can see what 48 million looks like up in smoke. The Russians are not coming, there was probably 3 other boats going across to Atlantic its a sad fact but when there is a demand then there will be a supply no matter how it gets to far end.